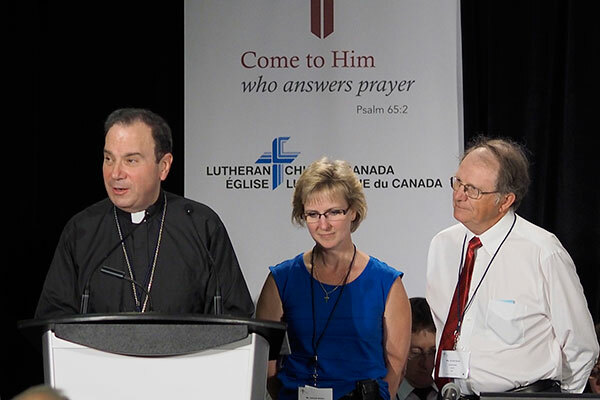 VANCOUVER – On Sunday, the convention recognized the work of outgoing Board of Directors members: Rev. Dr. Karl Keller (Walnut Grove, B.C. ), Anne Taylor (Ottawa, Ontario), and Lorne Wirth (Regina, Saskatchewan). Of the three, only Dr. Keller was able to be present for the event. The convention also recognized the service of BOD member Frank Belden (Summerland, B.C. ), who sadly passed away in 2013. Frank’s wife Deborah was present at the convention as a voting delegate, and was honoured in Frank’s stead.